Facebook COO Sheryl Sandberg is taking a lot of heat from the recent comments she made on 60 Minutes about the role of husbands vs. wives in a two-career household. For one, she thinks that women should be doing more at work and making their husbands do more of the childcare and housework at home. And with that, women should also take more responsibility for their career success. "Everyone knows that marriage is the biggest personal decision you make, but it's the biggest career decision you can make,” Sandberg said. “Partner with the right person because you cannot have a full career and a full life at home with the children if you are also doing all the housework and childcare." So what is so controversial in our society with having a husband that is the primary household manager, child-raiser, laundry-doer, and house cleaner? A colleague once shared a discussion she and her husband had undergone during a life-stage intersection that looked something like this: two working parents + a toddler + daycare + graduate school. They were at the point when they realized that both of them could not pursue their respective careers (he was a middle-school teacher and she worked as an advertising SVP) and properly raise their son. She said to me: “We finally decided that we had to ‘pick a horse. '” Translation: they decided which career would be the best bet for their family. In their case, her six-figure advertising salary trumped his schoolteacher's. His schedule was much more flexible. Hers was much more lucrative. What's interesting is that the communications industry seems to be leading the way on this new paradigm where women lead as primary breadwinners while their husbands or partners stay at home. In an unofficial survey of my colleagues from the past 15 years – all marketing, PR, advertising, and creative types – it's a not-uncommon scenario to find the woman in the household making the big bucks while the man minds the home and raises the kids. An agency MD whose husband is a part-time entrepreneur. A consumer marketing head married to a freelance writer. A director of internal communications paired with a film and video editor. It's not without guilt on either side. “I got looks today when I was at the museum with our baby from people who must have thought I stole him,” says one stay-at-home dad. I'm lucky. I work at an agency that values working parents and encourages true work-life balance. Unfortunately, that's not the norm. Maybe Sheryl Sandberg hit a nerve. But it's the conversation that we need to continue. Both our daughters and our sons will benefit. 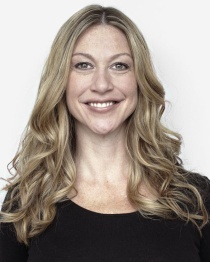 Emily Buchanan is a senior principal and chair of brand marketing and social engagement at Carmichael Lynch Spong.